04.03.1833/17.05.1833, Specimen eines 5,5 % Loans über US-$ 1.000, o. Nr., 23 x 33,3 cm, schwarz, weiß, lochentwertet, KB, Randschäden, Auflage 100. Das Zertifikat war der Auftrag an den Drucker Clark & Raser in Philadelphia 120 Exemplare zu drucken. Das Stück befand sich in den letzten 36 Jahren in einer Privatsammlung. R12! 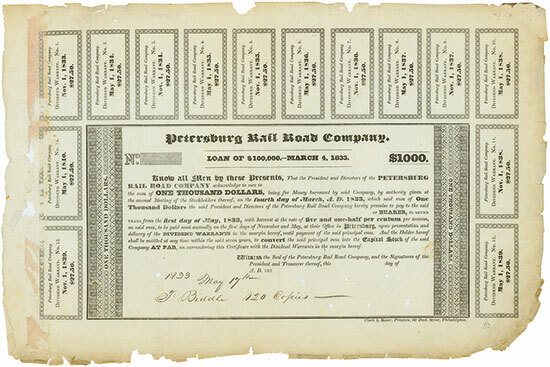 4 March 1833 / 17 May 1833, Specimen of a 5.5 % Loan for US-$ 1,000, o. Nr., 23 x 33.3 cm, black, white, hole cancellation, coupons, edge damage, only 100 bonds were issued. This certificate is an order to the printer (Clark & Raser, Philadelphia) to print 120 copies. The certificate was in a private collection for 36 years. R12!